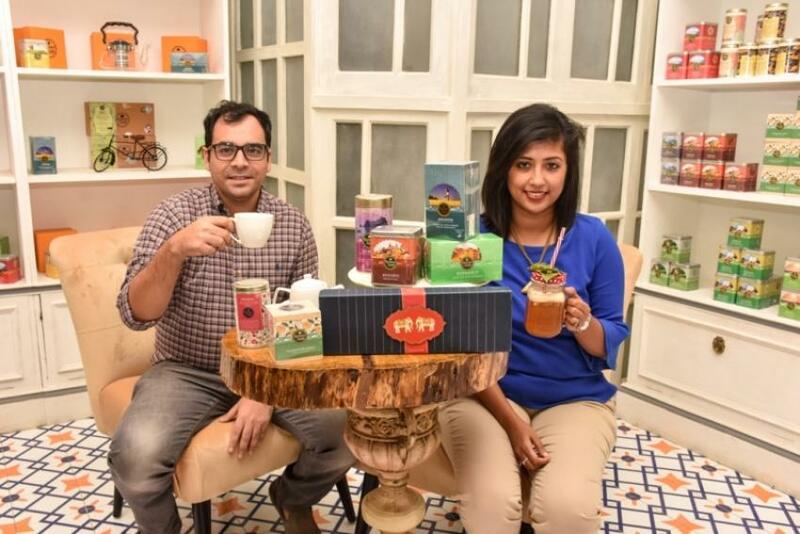 Dhiraj and Priti Sen Arora, the owners of Kolkata's upscale boutique tea bar and retail outlet "Karma Kettle", want to promote a healthy lifestyle through their latest venture. The neatly furnished Swinhoe Street facility offers one the opportunity to taste different kinds of teas. Sudipto Maity catches up with Dhiraj for a brief chat. A quirky, playful tea company specializing in creating eclectic blended teas & tisanes using premium ingredients sourced from across the globe. Inspired by global travels, Karma Kettle aims to take you on a voyage across the globe with a teacup. Whose brainchild is Karma Kettle? I'm guessing there's a story behind how you came up with this particular name, if yes, what is it? It is my idea. The name ‘Karma Kettle & Rhapsody’ was coined as early as 2005. I wanted to set up a tea room in Singapore serving up authentic Anglo Indian food. “Karma Kettle” itself was intended to be playful take on a traditional English tea room concept- by adding the word Karma it gave an Eastern touch to this concept. Is Karma Kettle an extension of Darjeeling Kurseong based Chai Country? Chai Country was the reason why we needed to set up Karma Kettle. We have visitors who come from all across the globe to stay at our hotel- Cochrane Place. On trying our innovative tea blends- we would get requests from guests to package a blend they particularly liked, so they could go back home and enjoy. This sparked the need for us to revive the tea packaging and Karma Kettle came back! Tell us briefly about the services offered by this facility. Our tearoom in Swinhoe Street, Kolkata is the one of a kind Sensory tearoom & Retail store. Up until March 2017, we only had an online presence and the increased demand for our teas warranted the need for us to set up a Sensory tea room & Retail outlet. All visitors who drop by are given free tasting of our teas- as we strongly believe in the need to educate customers on our tea range. We recently launched a High tea menu for two where we’ve carefully selected the food to pair with our teas and to revive the ritual of Afternoon tea. Dhiraj, I have been informed that you ditched the acceptance letter to study Chemistry at Cambridge University for a Bachelor’s degree in Business Administration at Acadia University in Canada, in hindsight, it paid off. Tell me, were you nervous doing so at that particular moment? Absolutely, at that particular time I was rebelling against my family’s wishes and deliberately ditched my acceptance letter. I wasn’t particularly nervous because I was sure that Chemistry wasn’t in my interest or life’s plan. I did however know that I was a risk taker and loved thinking creatively- that a 9-5 job wasn’t for me. In my parent’s defence, I could image the fear and frustration of my parents, but they supported me in every step of the way and I wouldn’t be where I am, if it weren’t for their faith in me. What do you make of the Tea business in India? It’s an exciting place to be in right now. There are many tea players who have stepped into the Indian tea industry in the last 2-3 years who’ve changed the way tea is being packaged and presented to the Indian market. Tea has evolved to so much more than CTC or Masala chai. Indians have woken up to blended tea varietals, detox teas and green teas. There will always be a market for orthodox teas. The established tea companies have realized this and are jazzing up their packaging and tea blends. Having said that its extremely competitive- there is enough space to create your own niche and I believe Karma Kettle has achieved just that. We began with selling loose leaf blends online- in the past 2 years we’ve introduced Pyramid teabags, offering customized labeling & packaging, set up a Retail store and are set to launch our Staple free Double Chambered tea bags in December this year! When it comes to selling tea in India, I feel there's no novelty...yet, since you are doing it, there must be something. What new are you offering/ looking to offer through this venture of yours? Our USP is definitely our Wellness teas- a careful amount of research and studies have gone into determining the right blends for this market. We stay away from all artificial flavoring & colorings. I strongly believe in embodying a healthy lifestyle and through Karma Kettle I aim to do precisely that- however we want to make this interesting & appealing to the customers without boring them. You offer a wide array of tea, in terms of flavours, if you have to choose three flavours/kinds from here, what would they they be, in terms of preference. Also tell us why are you suggesting those particular flavours/kinds. Moksha- it’s a black tea blend with peppermint, vanilla, lotus flower and leaf- a superb detox tea that has a refreshing taste. Lotus flower and leaf are said to speed up the metabolism. Karakoram- a caffeine free tisane that comprises of Lavender, Seabuckthorn and Nettle. Lavender brings in a beautiful aroma and flavour to this infusion and Seabuckthorn and Nettle aid in common allergies and curing stomach ailments. Table mountain- another caffeine free blend we’ve created by blending Rooibos tea with sage, liquorice, fennel and vanilla. The result is a delicious nutty flavored tea with a smooth silky caramel finish. Myth-busting time! What's the most common myth, misconception about tea in India that you have come across? The most common claims in favor of drinking green tea are its low caffeine content and high antioxidant value. In reality, some varieties of green teas ( Matcha, Gunpowder tea) have just as much caffeine as other varieties. Green tea possesses more antioxidants than black and Oolongs but Black and Oolong teas also contain anti oxidants. Oolong tea contains a high amount of polyphenol content- which boost’s the metabolism and aids in weight loss. Pu-erh tea is an aged and fermented tea which is available in both Black and green variants- they are revered for their health benefits.